Eric Maynard, a member of The Mohegan Tribe, just concluded a successful internship with the Yale Indian Papers Project. Beginning in June and running through October, his primary responsibilities included learning the workings of our Mukurtu-based Native Northeast Portal platform. To that end, Eric participated in a number of tutorial and training sessions with Project staff which prepared him to create, edit, and publish Digital Heritage Items (DHI) associated with participating Massachusetts Native communities on the Project’s platform. These DHIs (combinations of document images, metadata, and transcriptions of primary source documents) could then be shared with tribal representatives for review before being made public. In 2016, Eric interned with the Project, with his work then focusing on document transcription. This, together with his library science background, made the transition to DHI creation and editing a natural next step. Another of Eric’s tasks was to develop and implement a list of keywords for the creation of DHI metadata. 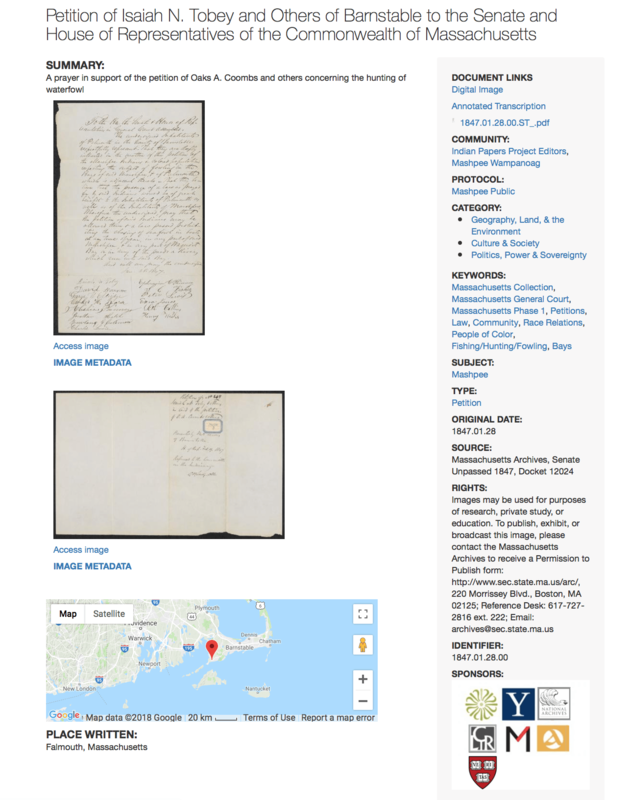 The metadata and scholarly transcription process focused on legal petitions and resolves, ranging from the late 17th Century through the early 19th Century. Specifically, Eric’s transcription work encompassed documents relating to Chappaquiddick, Mashpee, Aquinnah, and Stockbridge communities. Often these documents described land and property disputes, with Native peoples requesting legal and monetary relief and justice from the Massachusetts General Court. While it is not wholly evident from these documents that justice was regularly served, the responses from the Court were typically in favor of the aggrieved Natives. Eric found the internship to be enriching as an educational experience, and on a regional and personal level. As a resident of Southeastern Connecticut, Eric felt that the internship gave him a more informed sense of Massachusetts local histories and Native and Colonial government-to-government outcomes. The Editors want to thank Eric for his hard work and look forward to other opportunities to collaborate with him in the future.